Evan Rachel Wood portrays Dolores Abernathy in the Westworld TV show. She is one of the main characters and is a host discovering the truth about herself gradually with the help of William. At the beginning of the show she is a simple farm girl and wears a vintage blue dress that has been custom made, when William comes along, her behavior starts to evolve and she trades her 1800s-era dress for a more action-friendly outfit. 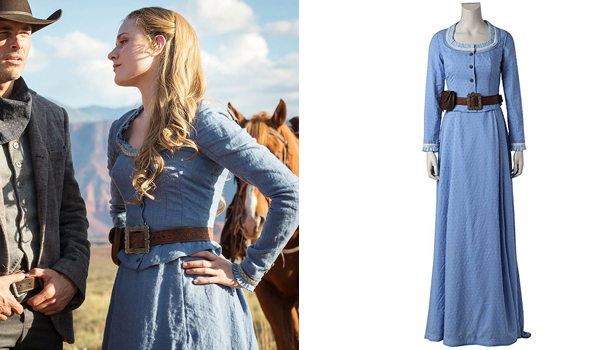 The dress that Rachel Evan Wood wears in Westworld for her Dolores Abernathy role in the first episodes is a vintage light blue farm dress. It has been custom made and 3D printed exclusively for the show by the costume designer Ane Crabtee. All is not lost however as a complete replica has been made ! 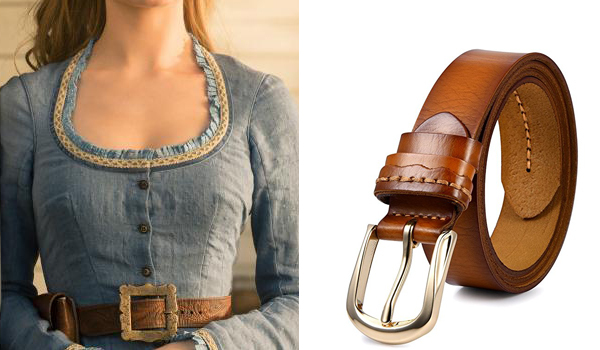 The belt that Rachel Evan Wood wears in Westworld for her Dolores Abernathy role in the first episodes is a light brown belt with a square golden buckle. It has been custom made and 3D printed exclusively for the show by the costume designer Ane Crabtee. You can buy this classic leather belt and stick a square cardboard buckle to it by cutting it yourself and spray-painting it gold. The original buckle used in the show comes from Abbey England and you can purchase it here. 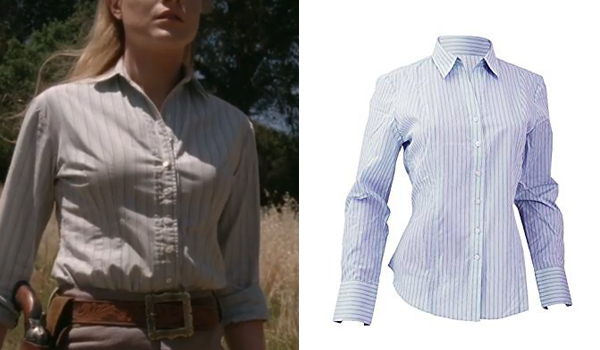 The shirt that Rachel Evan Wood wears in Westworld for her Dolores Abernathy role is a light blue long sleeve striped shirt. The Brook Taverner Blue Blouse is a very close match. 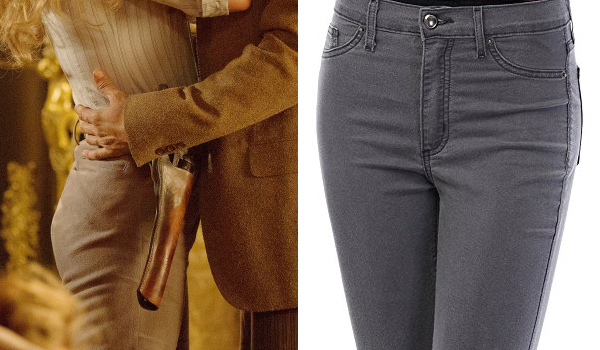 The pants that Rachel Evan Wood wears in Westworld for her Dolores Abernathy role are gray pants with a slight velvet texture to them. You can either use gray jeans or these pants. 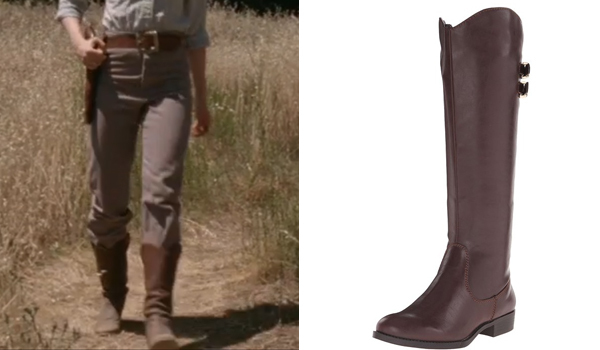 The shoes that Rachel Evan Wood wears in Westworld for her Dolores Abernathy role are brown riding boots. The Lullaby Chelsea Boots are a very similar. 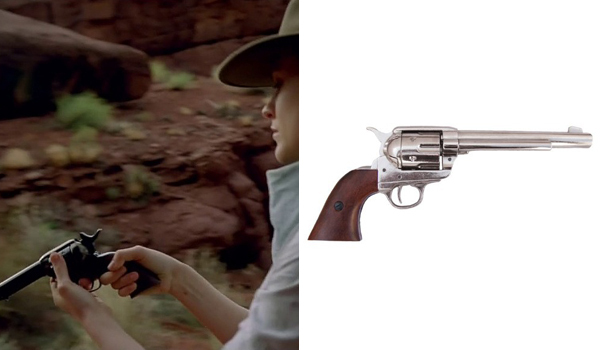 The gun that Rachel Evan Wood uses in Westworld for her Dolores Abernathy role is a Colt Single Action Cavalry Model according to the Internet Movie Firearm Database. This revolver is an exact non-firing replica. I couldn’t find the leather belt pouch either.